This page will cover the 1986 through 1991 releases of American Silver Eagles, and provide information about each edition of the coin. With 1986 being the inaugural year for the Silver Eagle series, its popularity among collectors is essentially guaranteed. Nonetheless, enough 1986 coins were minted to keep the premiums for this coin at a minimum. More than five million 1986 Silver Eagles were purchased, although the bullion coin was sold only for the final two months of 1986. Since the coins were available for twelve full months, the number of coins minted saw an escalation the following year. There were 5.3 million Silver Eagles minted as bullion. To date, the 1986 Proof Silver Eagle has the highest mintage for a proof coin in the series, with more than 1.4 million undergoing production at the San Francisco Mint. This proof is marked with an “S”. Originally, the coins were offered for sale by the U.S. Mint for $21 each. Notably, the average price of silver was $5.47 per ounce in 1986. 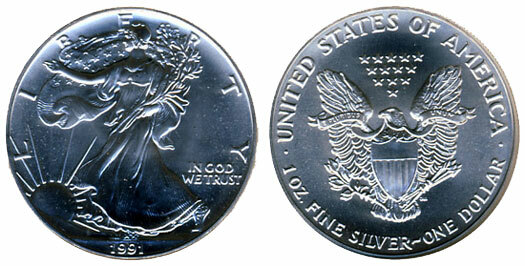 The 1986 Silver Eagle was packaged in a velvet presentation case and sold individually. A purple outer box was included, as well as a certificate of authenticity that was signed by Donna Pope, director of the mint at the time. For the numismatist, finding a high grade 1986 Silver Eagle is quite a challenge. The 1987 American Silver Eagle is the second coin in the American Silver Eagle series. The coins in this series were available for sale for the whole year. In the previous year’s inaugural release, bullion coins were only available for the last two months of the year. Bullion coin sales reached a record high of 11 million in 1987, which was the greatest level of bullion coin mintage for the series for over twenty years. The record held until 2008 when it was finally broken. There were 11,442,335 bullion coins minted for the series in 1987. 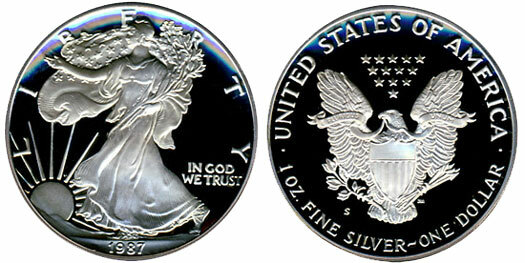 Nonetheless, the 1987 Proof Silver Eagle mintage fell when compared with inaugural year numbers. This is common in collector series. 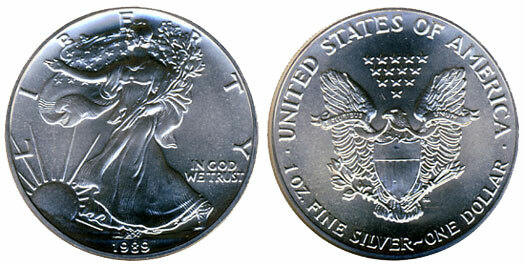 Proof Silver Eagles were sold at $23 per, which was a $2 increase from the 1986 sales price. The U.S. Mint kept similar packaging for proof coins, including the mint mark “S” on the coin’s reverse. There were 904,732 proofs minted in 1987 for this series. Collectors should know that the PCGS has never certified a 1987 Silver Eagle Proof as perfect M370 grade. 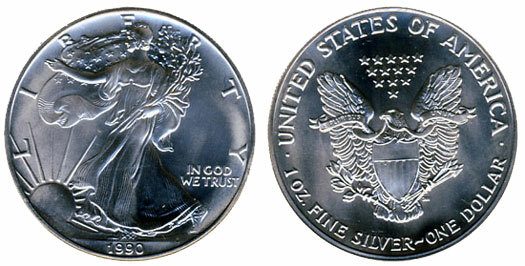 With the release of the 1988 American Silver Eagle, the series entered year three. The 1988 release was significant in that it saw the volume of bullion coins being produced fall by just over fifty percent from 1987 levels. The 1988 Silver Eagle bullion mintage dropped significantly to just over five million coins, with around 550K proofs being minted. This was due largely to the fact that the decreased demand for precious metals. The trend of producing less is one that would follow the Silver Eagle series for the remainder of the Eighties and most of the Nineties. The price for proofs during 1988 was $23, which remained the same as 1987 pricing. Notably, the price of silver overall, on average, during 1988, was $6.53 an ounce. Collectors of NGC and PCGS-graded coins should know that finding a bullion coin in perfect grade under is quite difficult. Marking the third year of the American Silver Eagle Series, the 1989 Silver Eagle came out with an uptick in mintage, at least for bullion coins. The price of silver fell during 1989, with an overall price average of just $5.51 per ounce. In 1989, the United States Mint sold 5.2 million silver bullion coins, which was a bit more than the mintage levels seen in the previous year. 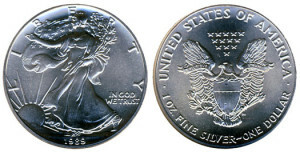 With the minting of the 1989 coins in the series, the U.S. Mint had produced and then subsequently sold more than 25 million ounces of silver. 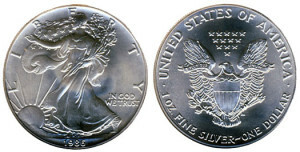 As compared to the low levels of 1988, the 1989 Proof Silver Eagle saw a big gain. This proof was manufactured at the San Francisco Mint and was sold for its original offering price of $23 for each coin. The reported mintage of final record was more than 617,000. For collectors, a perfect grade NGC coin in PF 70 or MS 70 condition are easier to come by for 1989 issues than for those issues of previous years. The few perfect examples that are graded by PCGS are relatively few and far between, however. The fifth year of the American Silver Eagle Coin series, the 1990 coin saw another slightly incremental increase over the year before as far as mintage of the bullion coin goes. The price of silver continued to decline during the year. In fact, 1990 would see silver fall as low as $3.95 per ounce with the highest price paid that year being $5.35 per ounce. This was the second year that annual sales had increased following the big decline that was seen in the series following its first year of issue. The U.S. Mint produced a total of 5.84 million Silver Eagle bullion coins in 1990. The proof Eagle coin for 1990 saw a slight increase again, with almost 700,000 cons being sold. This figure would later come to be seen as a high point, albeit a temporary one, in production. In the years to follow, the proof mintage of the Silver Eagle series would not see this level of production until the year 2001. The proofs were minted with a high-quality cameo finish and then paced in a velvet case along with a certificate of authenticity (COA). Originally, the 1990 proofs in the series were offered for sale at $23 each. The sixth year of the American Silver Eagle Series, 1991, saw the U.S. Mint increase its production of the bullion coins in the series yet again. This marked the third year in a row that the Mint undertook such an increase. The number of bullion coins minted in 1991 under the American Silver Eagle series was 7.1 million. This figure is representative of a temporary peak that would not be seen again until 1999 when the collectors would drive the mintage of the coin to greater levels. The average price for silver during 1991 was $4.05, although a low of $3.61 per ounce was seen that year. The proof for the 1991 American Silver Eagle experienced a drastic decline to just above a half-million coins. The proof coins were sold for the original price of $23 to collectors. Notably, this price was the same asking price that had followed the series through since 1987. These coins were once again minted at the San Francisco Mint with a cameo finish and packaged for collectors with a certificate of authenticity (COA). 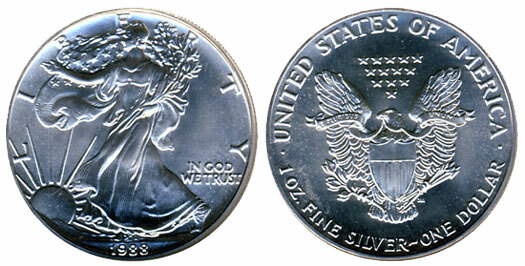 Ultra Cameo perfect NGC PF70 Silver Eagles can be found, although MS70 coins can be quite hard to attain. Perfect coins in PCGS holders are quite hard to find in proof and are non-existent for those who are looking to collect bullion coins for the series in this format.